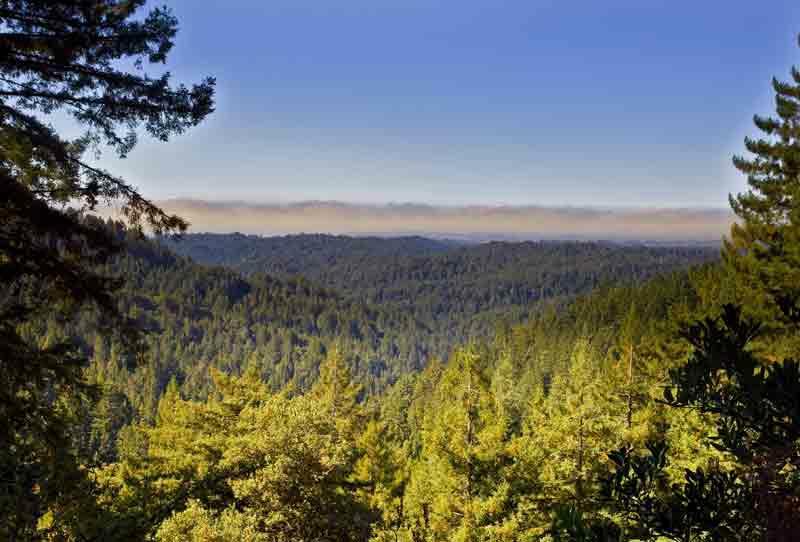 Whether you travel by foot, bike, or car, a road trip through the redwood Forest of Nisene Marks should be on your bucket list. 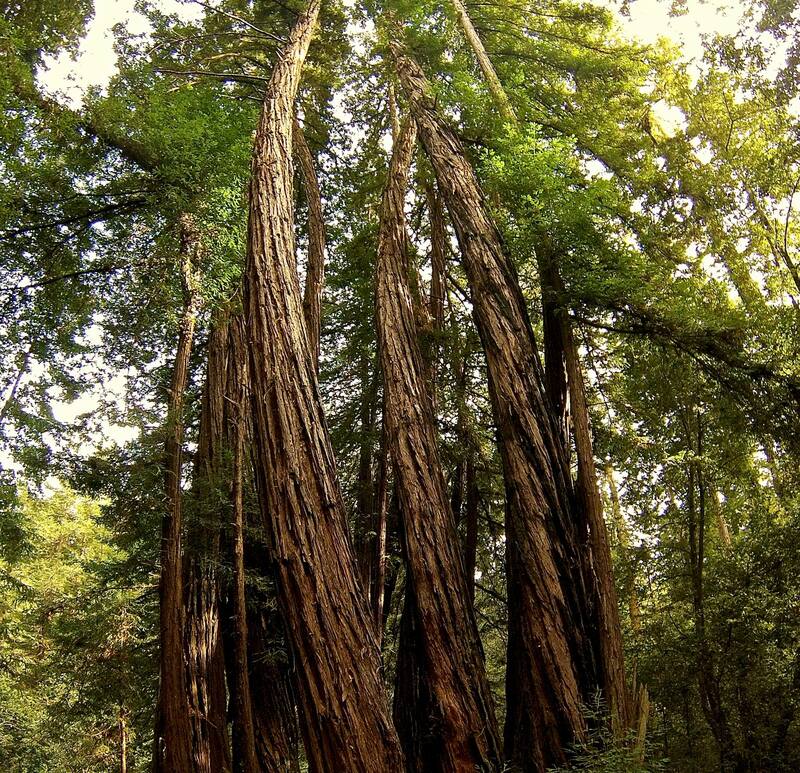 Located just off the Pacific Ocean coast and a short cruise through Aptos, California, this magnificent old-growth redwood forest spreads from the sea level town inland and up steep mountains elevating several thousand feet high. 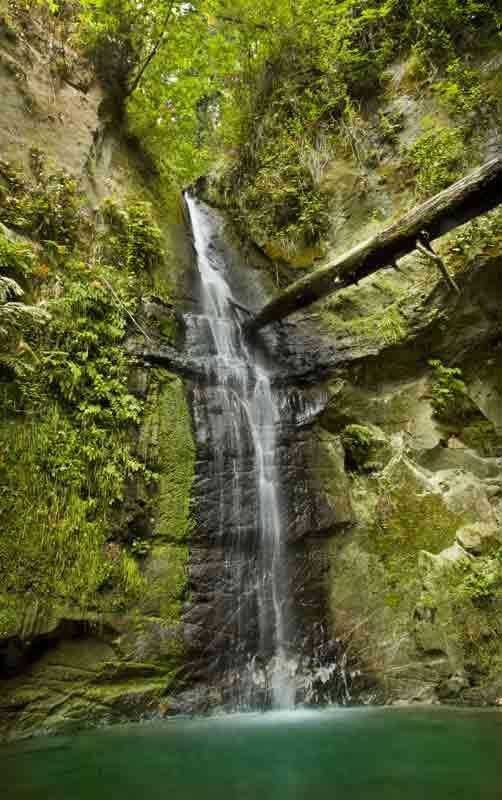 The wild landscape of Nisene Marks State Park features the unparalleled beauty of northern California nature – 10,000 acres of ancient redwood groves, weathered canyons, waterfalls and fern-laced creeks make this environment appear prehistoric and perfect for exploring. Nisene Marks is home to hundreds of diverse plant and animal species, and hosts countless amounts of awestruck visitors every day for hiking, biking, picnicking, and camping. Since 1992, the task of preserving the ever-evolving habitat and protecting the people who traverse its 30 miles of trails has been in the hands of a local, all-volunteer organization – the Advocates for the Forest of Nisene Marks. The Advocates educate the public about the forest’s unique history and ecology, and engage volunteers in projects that keep the park trails and roads maintained and safe to navigate. Through collaborations, projects, and the Nisene Marks Volunteer Trail Crew, the organization helps make it possible for the forest to continue to thrive and improve. In 2017, the non-profit was awarded “Organization of the Year” by the Aptos Chamber of Commerce, in honor of the dedicated Advocate members who keep Nisene Marks protected and road-trip worthy every year, rain or shine. Hats off to the organization, now celebrating its 25th Anniversary, and represented in the following interview by Advocates Ambassador John Fuchs, President Allison Livingston, and Director Melanie Dominguez. What are some of the projects the Advocates have been a part of over the years? For the past 25 years, we have helped maintain and repair the Park’s trails, bridges and even the ‘out-buildings’. We do this through our hard-working volunteers. Once a month, we head out onto the trails to brush-back, remove obstructions, maintain drainage, and grade the trail surfaces as necessary. 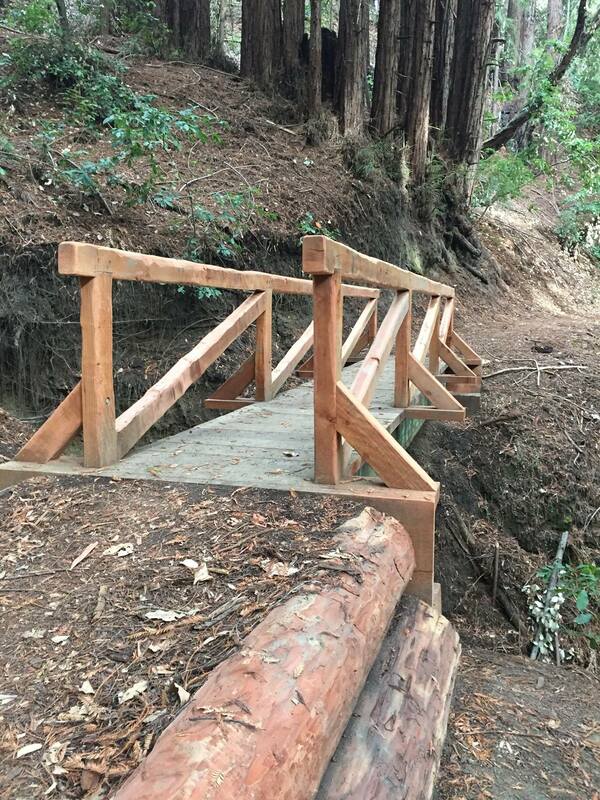 We also install and remove the seasonal bridges over Aptos Creek, each Spring and Fall. Additionally, we act as a ‘liaison’ to State Parks advocating for the wants and needs of the Park users. In that role, we have been supportive in the development of the General Plan, installation of Margaret’s bridge, the creation of the ADA trail to the Wagoneer Overlook, benches at Santa Rosalia, Interpretive Panels and Dust Abatement on the Fire Road – to name just a few. Through the generosity of the community, we raise money to fund these projects and many others. And those green maps that you pick up at the Kiosk – that’s us. We also work collaboratively with Friends of Santa Cruz State Parks and serve on their Nisene Committee to pursue even larger projects. By the end of this year alone, all 3 bridges will have been replaced on the Bridge Creek trail along with the bridge at the bottom of the West Ridge trail. 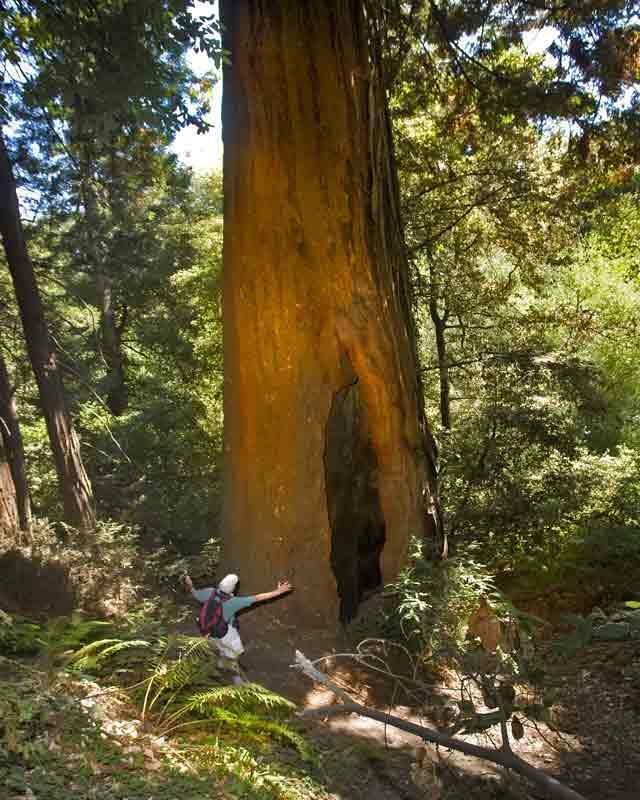 That’s two great organizations taking care of this big, beautiful redwood forest. Aside from taking care of the park with the Advocates, what are some of the ways you enjoy Nisene Marks? John Fuchs: Personally, I enjoy hiking and mountain biking in the Park, and learning about it’s history. I enjoy taking out-of-town friends and family into the Park. I’m also a member of an organization called Trips for Kids Santa Cruz. We take underprivileged kids mountain biking, and this is one of our favorite destinations. The kids love the redwoods and the creeks. 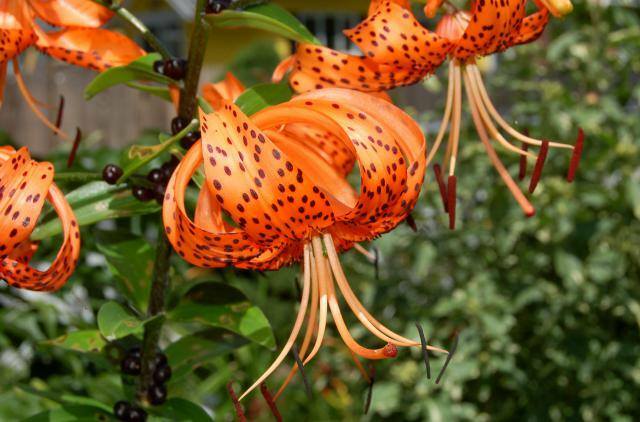 Please share why this organization is vital to preserving this area’s unique environment? John Fuchs: The budget for California’s beautiful network of State Parks is insufficient to maintain the Parks in their current condition, much less make needed improvements or expand the Parks. State Parks increasingly rely on private organizations like ours and others to help. What are a few of the lesser known facts about Nisene Marks that visitors might like to be aware of? John Fuchs: The epicenter of the 1989 quake is on the Aptos Creek Trail…and further up that trail if the bridge is up is a hidden lagoon. There’s also White’s Lagoon on the Big Slide Trail. I also love the Big Stump area (sadly it was formerly the Big Trees area). 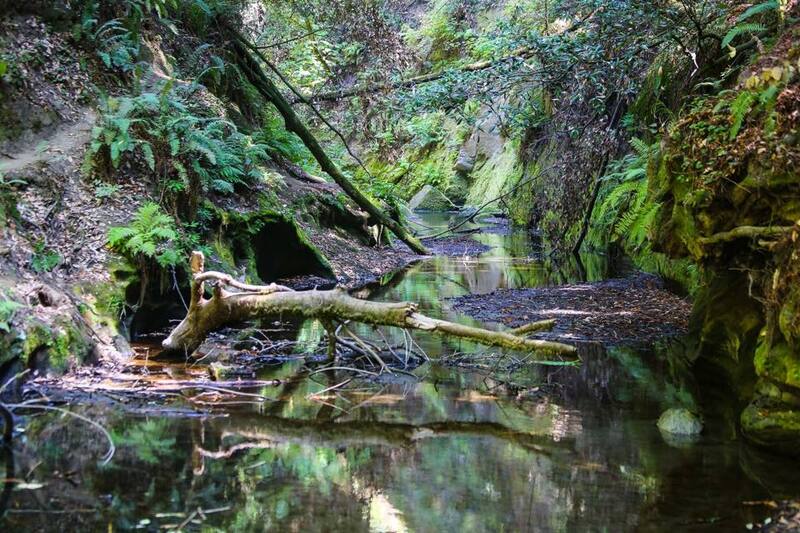 All the trails in the lower section of the park are fun to walk in early winter as they travel close to Aptos creek. 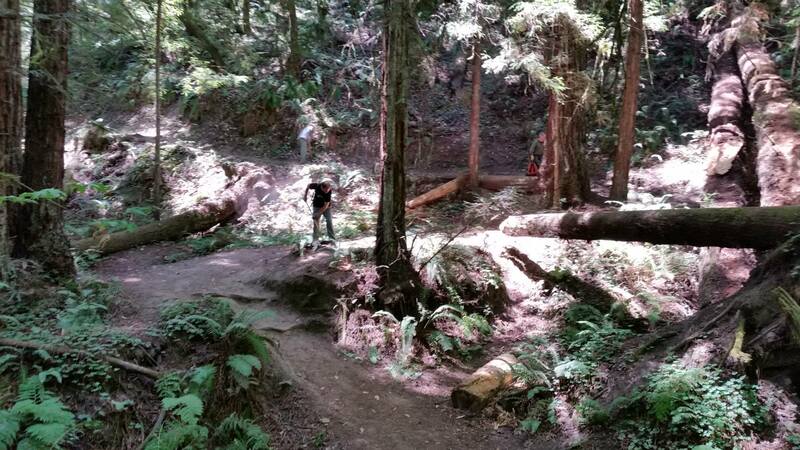 The Old Growth Loop Trail is especially fun in the summer months and is easily accessible from the entrance station. Summer months are also a good time to explore the park’s upper trail past the Porter Picnic Area. Melanie Dominguez: Bikers can enjoy the Fire Road all year round unless there’s significant rain. 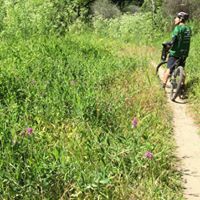 The Lower Split Stuff Trails are fun on a cross bike or mountain bike, otherwise riding up and over to Soquel Demonstration Forest is great for the expert/experienced rider. No trails should ever be ridden in the rain though, as it ruins the trail and increases errosion. 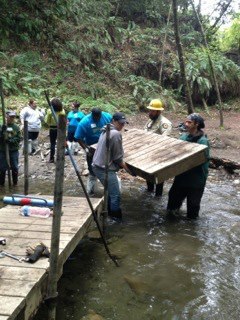 How can the community contribute or participate in activities to protect and maintain Nisene Marks State Park? John Fuchs: We need trail work volunteers for our monthly trailwork days. We need volunteers to serve on our Board of Directors, especially an IT and/or marketing person. We rely on donations to fund our efforts in the park. 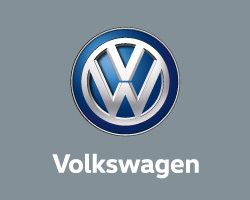 The community can learn more by visiting our Website or Facebook page. Photos credited to the Advocates of the Forest of Nisene Marks.